We’ve finally reached the end of this “Legion Trilogy.” First we looked at the super hero mystery/thriller that was “The Lightning Saga.” The we tackled “Superman and the Legion of Super Heroes,” a finely crafted love letter to Superman and his influence. Now we come to “Final Crisis: Legion of 3 Worlds,” a book that not only caps off this era of Legion stories, but story threads from numerous other books as well. Johns and original “Crisis” illustrator George Perez go all out, creating one the biggest, most bombastic love stories to the Legion, or comics in general you’re likely to ever lay eyes on. Superstar writer Geoff Johns and legendary artist George Perez deliver the Crisis of the 31st century as the Legion of Super- Heroes reaches out for help against a powerful foe they can’t beat alone! From the moment Superman landed on Earth until the end of time, the Time Trapper has sought to erase Superman’s impact on the universe. But the Legion of Super-Heroes have always been there to stop the relentless villain. Now, one Legion isn’t enough as the Time Trapper taps a twisted mirror image of The Boy of Steel from a parallel Earth long dead: Superboy-Prime! Who will answer the Legion’s call for help? With ties to INFINITE CRISIS, FINAL CRISIS and the history of the DCU, this tremendous miniseries is not to be missed. Let’s get this out of the at the onset; this story has nothing to do with “Final Crisis.” While it could be argued that the event fits in somewhere between the events of “Superman Beyond” and “Final Crisis” #6, there are literally no references to Morrison’s divisive (but wonderful) event. That said, this is far from a “Crisis” book in name only. “Legion of 3 Worlds” connects to nearly all of Johns’ DC work to that point. Continuing story threads from “Green Lantern,” “Infinite Crisis,” “Justice Society,” “Teen Titans,” “Flash,” “Action Comics” and more, “Legion of 3 Worlds” packs an incredible amount of story into five oversized issues. While the mini-series could in no way be considered decompressed, it could be argued that the series suffers from having too much content. “Legion of 3 Worlds” is one of the most “comic booky” comics I’ve ever read. The series features parallel worlds and time travel, deaths and resurrections in nearly every issue, and a never ending cavalcade of colorfully clad heroes and villains. Quickly contrived plot devices mingle with moments of genuine brilliance to propel the sci-fi action forward at a breakneck pace, with copious amounts of exposition straining to keep suspension of disbelief in place. For better or worse, it feels like a return to the Legion’s Silver Age roots. As with “The Lightning Saga,” “Legion of 3 Worlds” works hard to juggle multiple concurrent threads. It has the advantage of a single creative team telling a singular story, though it requires an even deeper knowledge of DC history to fully appreciate. The cast of characters numbers in the hundreds, with origins stretching back to the 1960s. This book could reasonably be viewed not only as Johns’ biggest love letter to the Legion, but to his vision of the DC universe in general. As such, this is easily one of his most self-indulgent works. This is exemplified in the prominent use of Johns’ most indulgent character; Superboy-Prime. While not truly Johns’ creation, his take on the character from “Infinite Crisis” on is one of the most divisive re-imaginings in recent memory. Beginning with the reality-breaking punch heard round the world, Prime’s abrasive, juvenile antics progress to the point of caricature. If you aren’t a fan of the character and his fanboy mentality, then his presence will severely hinder your enjoyment of this book. However, if you enjoy the character, or can at least tolerate him, then you’ll be rewarded with some brilliantly meta story-telling. It truly says something that I’ve made it four paragraphs into this review without making explicit mention of the Legion of Super Heroes. The Legion, their world and their mythology form the framework for this story, making the whole thing possible. Nevertheless, they often take a backseat to the stories big moments; the return of major characters and the continued fall of Superboy-Prime. The very need for a team-up of three Legions is somewhat suspect, with the primary reason being Prime’s multiversal origins and psychic dream prophecies. That said, the Legion aren’t wholly overlooked. Johns pulls out all the stops, pulling nearly every villain in Legion history out of comic book limbo for this final onslaught. Several plot threads from “Superman and the Legion of Super Heroes” are revisited, including Sun Boy’s post traumatic isolation and the return of Earth Man’s Justice League. Some Legion stalwarts, like Bouncing Boy, the Green Lantern Rond Vidar, and Blok and the White Witch make their return. Johns and Perez sprinkle in countless visual nods and dialogue easter eggs to past Legion stories, some even I have likely missed. If there’s one aspect where the book’s excess is indisputably positive, it’s the artistic work of George Perez. It’s quite sublime that two of the creators behind the original “Crisis” and its follow-up would come together to craft what is arguably a true sequel. An undeniable legend in the industry, Perez arguably defined the event comic as we know it in “Crisis on Infinite Earths,” a story the “Legion of 3 Worlds” owes an incredible amount to. His sense of scale of is a perfect match for Johns’ universe and time spanning tale. Perez juggles the story’s mammoth cast with the greatest of ease. As someone with only the most moderate exposure to the “Zero Hour” or “Threeboot” Legions, I was able to differentiate the characters from their “original” incarnations. As hectic or dynamic the action gets, Perez always manages to guide the eye along a clearly defined path. Single pages pack in more panels than some single issues (a slight exaggeration, but only just slightly), yet they never feel so dense as to be unreadable. Perez displays a displays a diversity of page design and panel layout. One particularly striking page sees a fallen plummet from the sky through a series of long vertical panels along the left side of the page, while characters look on from the right side. Another impressive sequence featuring the always enjoyable Starman features a circular panel structure, framed with a striking field of stars. It’s great to see a veteran artist continuing to innovate in his trade. This marks the end of Johns’ work on the Legion, but the story certainly doesn’t end here. Threads from “Legion of 3 Worlds” carry into Johns’ and Francis Manapul’s short but delightful run on “Adventure Comics,” Paul Levitz’s modern “Legion of Super Heroes” runs, and the “New Krypton” era of Superman comics. 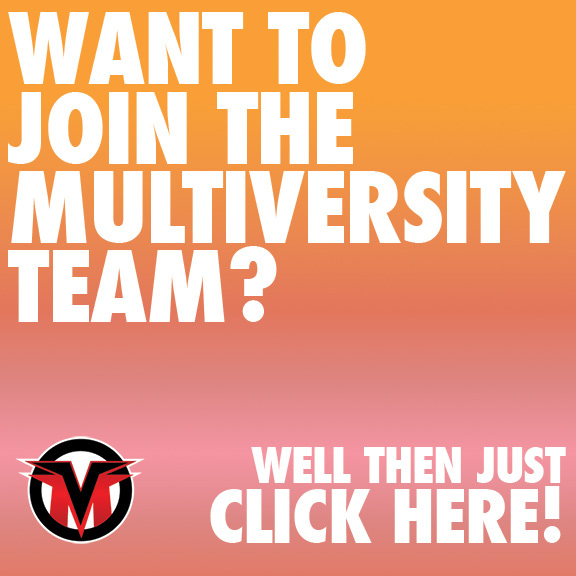 Multiversity’s Brian Salvatore has an extended look at the latter planed for the future, something I eagerly await. Still, for all the book’s plot threads that get carried forward, many fall by the wayside. The lost Legion of Earth-247 disappears, never to be seen again. The promise of a 31st Century Green Lantern Corps is touched on in Levitz’s subsequent run, but was ultimately forsaken. I still seem to recall a hint at a futuristic magic war, featuring none other than Alan Scott, in an “Origins and Omens” stinger from around that era. The concept gets a blink-and-you’ll-miss it reference towards the end of the volume, never to be seen or heard from again. The sheer wealth of story potential contained here is exciting, and I can only hope that such untapped potential sparks the minds of the next great Legion creators. While “Legion of 3 Worlds” isn’t quite as strong as the story that precedes it, I would argue that it marked a peak for the Legion. The past few attempts at Legion ongoings have under-performed, and it seems that DC has temporarily abandoned the property in favor of the “Justice League 3000” future. While there’s no telling when the next great run on the Legion will come around, if there’s one thing “Legion of 3 Worlds” shows us it’s that there is a wealth of Legion history to be enjoyed. Zach "The Mercenary" Wilkerson may sometimes act like he hates comics, but he generally enjoys them, mostly. Ask him about his encyclopedic knowledge of the Kingdom Hearts series and follow him on twitter @wilkerfox.